This week’s review is a hard cover book with a hard-hitting jacket, determined to catch your attention. 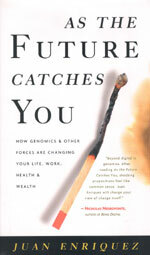 As the Future Catches You (ISBN 0-609-60903-3) is written by Juan Enriquez, the director of the Life Sciences Project at the Harvard Business School. It begins with, not an “introduction” but a page called “Before you start reading” in which author Enriquez exhorts the reader to go right through, returning if needed to difficult passages. He also assures that one does not have to be a rocket scientist to understand what he has written. He just wants you to understand the trends that are happening worldwide. Enriquez manages to show, very quickly, just why the world technology is moving, very quickly, and in what direction it is going. He states (and shows) the fact that the previous commodity based corporations which were once supreme have become dinosaurs. In place of oil, agriculture, automobiles, tobacco, the new wealth is in corporations dealing in (wait for it) genomics, bioinformatics, nanotechnology, photonics, robotics and aerospace. I must admit I have only heard of three of them and my spell checker only recognised two! Artificial intelligence is dealt with in chapter 8 with the “news” that in 8 years time a computer should have the same processing capacity as a human brain and by the middle of this century people will carry around computers with the processing capacity equivalent to the sum of all the brains in the United States. Are you ready for the concept of computers made from silicon and DNA that can bypass their own damaged sections and “regrow” organically? Are you ready for computer chips that can assess your DNA for over 4,000 genetic conditions right now, and for 100,000 within five years? You’d better! The review copy was provided by Bookazine with an RRP of 995 baht, and should be available at all major bookstores. It is a fascinating read. It is the ‘brave new world’ staring you in the face, with the message of ‘shape up or (be ready to) ship out’. His use of the English language is superb in the way it takes you racing from page to page. If you want “proof” for some of his sweeping statements (and that is really what every page holds), then you can turn to the end notes in the book where a comprehensive bibliography is printed for every chapter. When I initially picked up this book I looked at the price and thought, “This is a bit expensive.” After reading it, I now say it is too cheap. Get it, read it and give it to your kids to show them that you are still capable of keeping up - today! But tomorrow? When the definitive history of rock is written, one single accomplishment will demand Ronnie Montrose’s inclusion as a guitar great - his 1973 self titled album ‘Montrose’. On this album you are treated to Montrose’s Gibson Les Paul guitar roaring like a motorcycle or screaming with almost impossible sustain. Ronnie Montrose’s career first took off in the early seventies as a guitarist for Van Morrison. Following this he teamed up with Edgar Winter before forming his own band in 1973 with Sammy Hagar (vocals), Bill Church (Bass), and Denny Carmassi (Drums). Although Montrose never gained ‘Mega Star’ status, they still managed to build up a large following in Europe and the US and from 73-75 they undertook numerous tours supporting established hard rock acts including Black Sabbath and Deep Purple, which enhanced their reputation as a high calibre rock and roll band. The first album was originally issued in 1973 and was re-released in 1979 to coincide with the New Wave of British Heavy Metal (NWOBHM) which was flourishing at that time in the UK. Produced by Ted Templeman and written by the band it contains such songs as ‘Bad Motor Scooter’, ‘Rock the Nation’, and ‘Space Station Number 5’, which can all be described as Full-Tilt Riff-Rock at its very best. If you are looking for an album that will get the dandruff out of your hair and your neighbours banging on the walls, this is the one for you. ‘Good Rockin’ Tonight’ and ‘Rock Candy’ are further excellent examples of up tempo, foot tapping, beer drinking rock ‘n’ roll songs, which appear on the album and cry out to be played at maximum volume on your Hi-Fi system. Surprisingly, Sammy Hagar did not do any guitar work on this album, all of which was left to Ronnie Montrose and was one of the factors which led to unrest between the two of them and the band’s eventual splitting up in 1975. Hagar left to pursue a solo career, where he would at last get the chance to display his own skills on the guitar. Things between Hagar and Montrose had become so strained just prior to the split that, for the last dates of their final tour, they refused to stand anywhere near each other on the stage. Following the split of Montrose and a successful solo career Sammy Hagar went on to gain even more fame and fortune as singer/guitarist with Van Halen. In an era of highly polished, digitally mastered, nicely rounded at the edges productions that we now live in, it’s always a pleasure to listen to this album and enjoy that Raw Rock sound of the early 70’s. It really doesn’t come any better than this.